**Photography, Rustic White || This post was sponsored by Pottery Barn a brand I love. Recipe and opinions are 100% my own. Combine the cider, wine, cinnamon sticks, zest, juice, cloves and star anise in a large saucepan, bring to a boil and simmer over low heat for 10 minutes. Pour into mugs, add an orange and orange peel to each and serve. These photos are so beautiful! I love the composition. They feel so much like Fall (despite the steamy temps outside) and make me wish I had some mulled wine! This looks FABULOUS! I’m so jealous you’re in Sonoma … it’s one of my favorite places on the planet! This is something I’ve always wanted to make and just never got around to it. Love the photos! 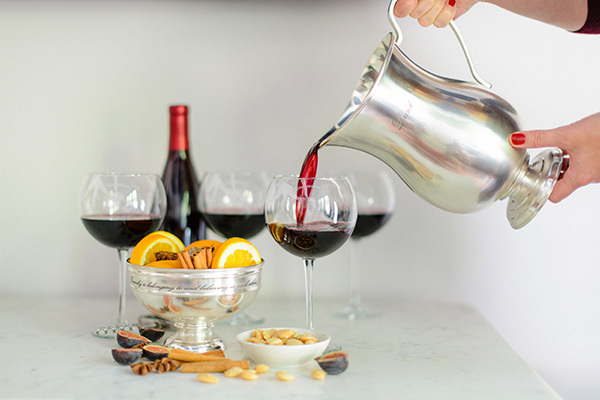 I am obsessed with mulled wine, isn’t it so delicious!! Hopefully this Atlanta weather starts to cool down soon, so we can actually enjoy it!! Yum! I’m jealous – what a great time of year to travel to Sonoma. Enjoy it is one of my favorite places!